What Day Of The Week Is September 23? 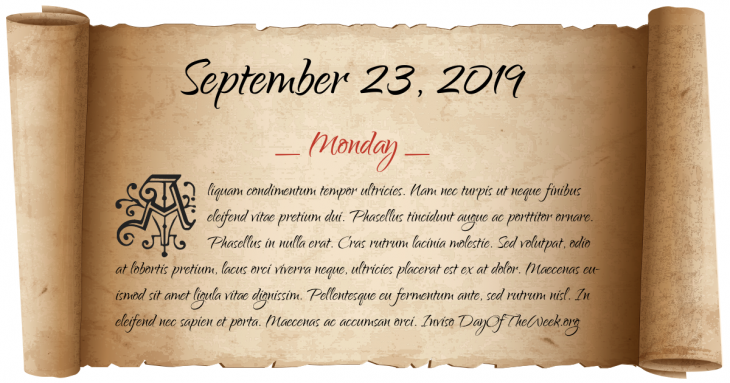 September 23, 2019 is the 266th day of the year 2019 in the Gregorian calendar. There are 99 days remaining until the end of the year. The day of the week is Monday. Norway and Sweden sign the “Karlstad treaty”, peacefully dissolving the Union between the two countries. Mobilization of the Czechoslovak army in response to the Munich Crisis. World War II: The first gas chamber experiments are conducted at Auschwitz. World War II: First day of the September Matanikau action on Guadalcanal as United States Marine Corps forces attack Imperial Japanese Army units along the Matanikau River. Philippine President Ferdinand Marcos announces over television and radio the implementation of martial law. José Canseco of the Oakland Athletics becomes the first member of the 40-40 club. Who were born on September 23?